At any given time, a particular country's market or a particular segment of the market-such as energy or technology-might be booming. 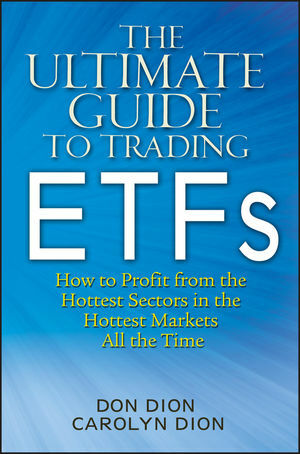 The Ultimate Guide To Trading ETFs provides a time-tested strategy for using exchange-traded funds (ETFs) to profit from these trending markets and sectors. By monitoring the performance of ETFs, authors Don Dion and Carolyn Dion show how to capitalize on these fast-moving, ever-changing trends. He then discusses how to stay ahead of the curve by identifying markets and sectors that are gathering momentum and monitoring those markets for signs that the momentum is losing steam. Dion also explains how you can build a balanced portfolio of ETFs and manage your allocations to profit from the shifting trends. The world of ETFs has created many options for individual investors, and The Ultimate Guide To Trading ETFs shows you how to make the most of those opportunities. DON DION is the publisher of the Fidelity Independent Adviser (fidelityadviser.com) family of newsletters. He is also President and founder of Dion Money Management (dionmm.com), a fee-based investment advisory firm to affluent individuals, families, and nonprofit organizations, where he is responsible for setting investment policy, creating custom portfolios, and overseeing the performance of client accounts. Dion began his career as a certified public accountant with Ernst and Young and holds a law degree from the University of Maine and an LLM in taxation from Boston University. CAROLYN DION is an analyst and associate editor for the Fidelity Independent Adviser family of newsletters, Dion Money Management's affiliate newsletter company. In addition to her role as analyst and editor, she is Vice President of Dion Money Management, where she assists in the development of ETF strategies. Before joining Dion Money Management, Carolyn worked as an ETF market maker for Kellogg Specialist Group on the New York Stock Exchange and American Stock Exchange. Dion received a bachelor's degree from Bowdoin College in Brunswick, Maine. Part I: ETFs – A New Way to Invest and Trade. Chapter 1: Taking an Active Approach with ETFs. Basic Tenets of ETF Investing. Three Must-Know Types of ETFs. Conclusion: the Discerning, Active Investor. A Book Is More than the Proverbial Cover. Chapter 3: Understanding Indexing: New Options for Investors. Targeting Sectors with Cap-Weighted Indexes. Beating the Market with Customized Index ETFs. Lifecycle and Hedge Fund ETFs. Part II: Asset Allocation Strategies. Chapter 4: Building a Portfolio Using ETFs. The Super Hands-On Active Trader. The Importance of Diversification: Nothing to Excess. Chapter 5: Trading: Navigating the Storm. Be Aware of the International Disconnect. When Newer Isn't Necessary Better. Big Picture and Short-Term View. Gaining Exposure through Regional Funds. Chapter 7: Gaining Exposure to Commodities. Physical Commodity ETFs – Panning for Profits. Beware the Futures-Backed Commodity Fund. Using ETNs to Gain Access to Commodities. Commodity Exposure, a Cautionary Table. Chapter 8: Staying Current with TIPs and Currencies. Part III: Tying It All Together. Chapter 9: Looking Ahead: A Changed Landscape. Victims of Their Own Success.